Lasso this Ranch is a way for you to store your favorite ranches. When you find a ranch you like on the website, lasso it up and it will be added to your favorites list. You can compare ranches side-by-side by adding more than one ranch. Try it out! I couldn’t have been more wrong. When my closest friends, Charlie, Tammy and Annie first approached me about taking our annual ladies vacation to a Colorado dude ranch, I was concerned. Visions of hot dogs, beans and wild children danced through my head. Like I said, though, I was wrong. To begin with, we made our reservations for an adults-only week in September. My hotdogs-and-beans theory vanished with meal one. We were treated to a dinner of grilled river trout, sautéed rosemary russet potatoes, fresh salad and a fine local wine selection. Our first morning on the ranch, we flew. Over the boulders and through the trees, down to the end of the line we zipped and screamed! It was a rush. It was a blast. It was a power-packed boost of adrenaline! But that’s just the speed. Vibrant red, yellow and purple flowers dotted the landscape, and the distant Rockies showed off their lower-level blankets of grass. There’s nothing like getting the zip-lining thrill amid the unparalleled natural beauty of Colorado. That afternoon, we explored the environment up close with a guided hike. Not only was our guide hilarious, but also very informative. Tammy peppered him with questions, apparently trying to find the extent of his seemingly endless nature knowledge base. She never found the limit. Our next excursion brought us to the test of a true cowgirl—horseback riding. The resident expert wrangler, Jarrod, guided the ride. In retrospect, I may have overemphasized my experience by stating with too much confidence that I was comfortable around horses. But after Charlie spoke of her equine familiarity, I didn’t want to admit to near-total ignorance. I was paired up with Blaze, a beautiful chestnut brown horse with a white stripe on her nose. After stepping into the saddle, I couldn’t help but notice the stunning surroundings. The old-fashioned barn backed by snowcapped mountains and endless blue skies seemed to resemble a painting more than reality. Jarrod, our rugged-fit wrangler was explaining how to use the reins and our legs to guide our horses. I like to think I’m a quick study. Plus I’ve seen a cowboy movie or two. I knew I had it. At Jarrod’s direction, Charlie made a clicking sound and steered her horse, Hotwheels, out like a pro. “Yee-Haw!” Tammy cheered, following their lead. “C’mon, Blaze,” I told my ride. “The other way,” I insisted. I saw where I wanted to go and I saw where I was headed. Not the same end. I tried reasoning with the horse, but she had her own plan. Annie, who is as soft-spoken and genteel as they come, let out a cowgirl-sized whistle that shocked us all, alerting Tammy and Charlie to my…um, situation. I had to admit, it was pretty ridiculous. My horse had turned around and gone back to her stall from the open corral. That left me on a horse, in a stall, while my horse was munching on some hay. Fortunately, without any condescension whatsoever, Jarrod came to my side and coached me out of the blunder. I paid close attention that time! That moment of humility became irrelevant in comparison to the magnificence of our ride. There were moments of single-file riding, for example when we were on a trail beside the gorgeous river, but mostly we rode across wide expanses of field where we had the freedom to ride side-by-side, take it slow, or pick up the pace. At Charlie’s request, our guide led us in a near-gallop. 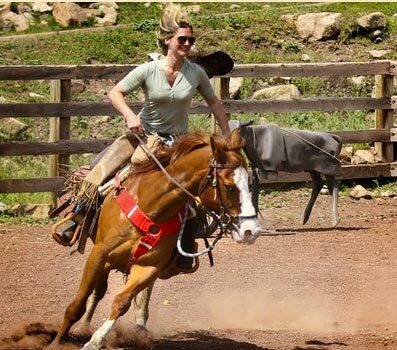 I have to say: sprinting on a horse was even more exhilarating than zip lining. Thrills didn’t end there. Later in the week we were in a different kind of rodeo. Our arena was the wild twisting river, paddles and a bright yellow inflatable raft replaced our reins and saddles. My gang and I sat toward the front. We heard those at the rear got the brunt of the bumps, while we got the splashes—in droves! We bounded between boulders and through rapids like a pinball, and rolled over small waterfalls getting doused anew each time. Each spray was refreshing and startling, and always a tangible reminder—in case there was any doubt—that we were having a blast. Don’t get the wrong idea. Our ranch vacation was wild and fun, and we certainly pushed our comfort zones, but we had our fair share of rest and relaxation as well. Campfire nights allowed us to catch up and re-tell favorite stories. We enjoyed a couple of lazy mornings—sleeping in and catching up on our easy reads. And when you get right down to it, all our adrenaline-pumping activities were refreshing too. I’d never before experienced anything quite like this dude ranch vacation. Far from the ideas of my initial trepidation, reality at the Colorado dude ranch proved to be both adventurous and restorative. Get in touch with your wild side on a Colorado dude ranch! Sign up to receive occasional emails from the CDGRA. Click here to receive a FREE full color brochure with information on all CDGRA ranches. Click here to see your saved ranches.